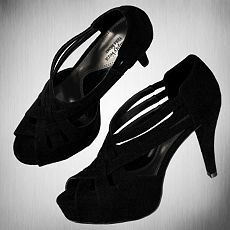 A few weeks ago, I got Simply Vera heels from Kohls to satisfy my lust for J.Crew's Platform Pumps (see here). Sadly, they didn't satisfy, not even close. And in-real-life, I just didn't like them on my foot. The fabric was soft, but fuzzy looking - like felt. Too-strappy looking on my foot. Because of the platform, I think the heel needed to be higher. My foot was an awkward height in the shoe (if that makes sense...). I think I would could have liked if they were real suede or a better faux-suede, less straps - narrowed down to 2 thicker straps and a higher heel with the platform. That's just my opinion. I returned these.